M-2000 Rolling Safety Ladder | David's Inc. Choose from 14", 21" & 28" D. top step. Made from rigid 1" OD tubing - handles 450 lb. loads. Features Serrated Grating, Expanded Metal, Perforated Step or Abrasive Mat treading. 30" handrails - measured vertically from front of step. Ladders ship unassembled. 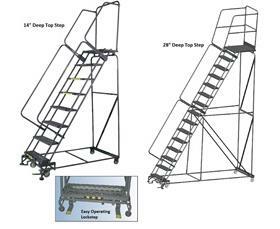 For fully assembled ladder see Related Items tab to order. Built to OSHA and ANSI standards. CAL OSHA available for 6-9 steps and 10 steps - see Related Items tab to order. Gray powder coat finish. FOB Shipping Point. 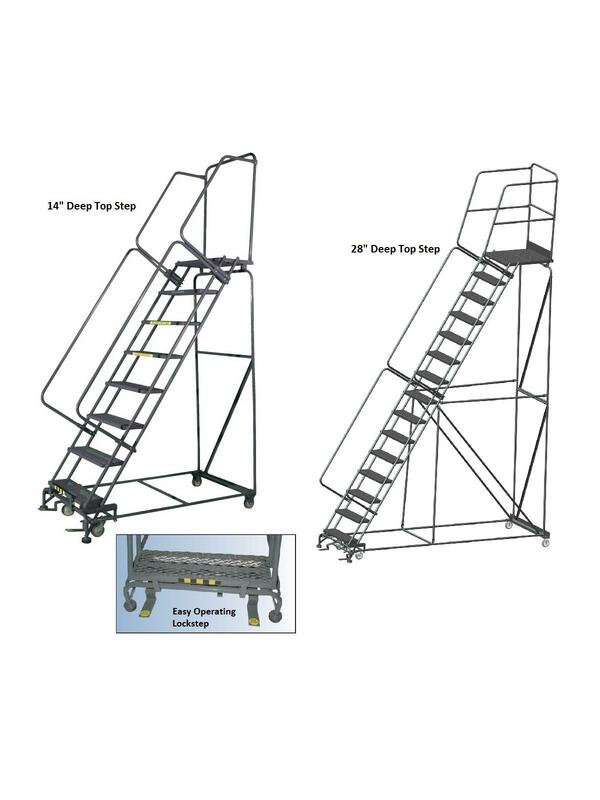 See Related Items tab for Options for M-2000 Rolling Safety Ladders.